Pinellas County leaders are on a mission to increase safety in the Lealman community. In Lealman, a large number of people do not own cars and rely on walking, biking or taking the bus to get to their destinations, and yet, there are huge gaps in sidewalks. PINELLAS COUNTY, Fla. -- — Pinellas County leaders are on a mission to increase safety in the Lealman community. In Lealman, a large number of people do not own cars and rely on walking, biking or taking the bus to get to their destinations, and yet, there are huge gaps in sidewalks. Pinellas County leaders found two-thirds of the area doesn’t have sidewalks at all. Pinellas County also found large gaps in lighting, which they believe may contribute to car crashes. 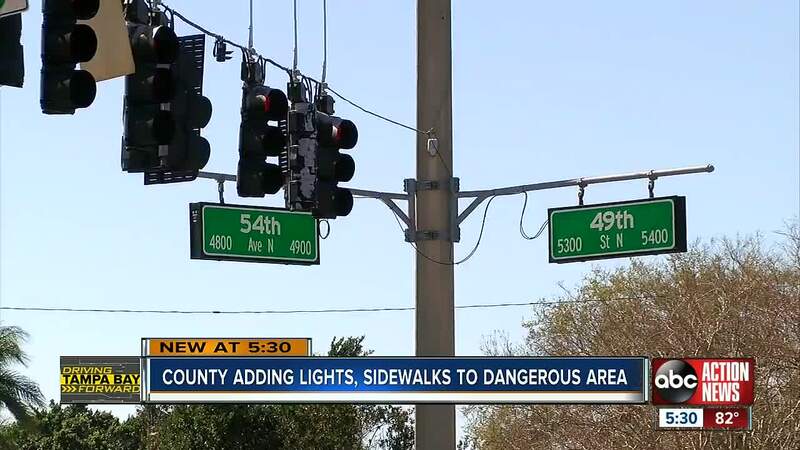 County leaders are putting an emphasis on safety changes along Haines Road, 62nd Ave N, 28th St N and 46th Ave N. The county says the Lealman area sees an “abnormally high crash rate” with 3,436 crashes over the past 5 years, including 19 fatalities. On Saturday (Feb 9), a 28-year old woman was hit and killed while riding her bicycle at 49th Street N and 54th Avenue. FHP says she tried to cross the intersection with a red light. Also on Saturday, two people were injured on a motorcycle when a car slammed into them on Haines Road. The motorcycle riders, 63-year-old David Rankin and 60-year-old Allegro Rankin, have several broken bones but are expected to be okay. St. Pete Police say the man who hit them stopped at a stop sign but failed to yield after stopping and hit the couple on the motorcycle. Pinellas County just received a $50,000 grant to jump-start improvements in the Lealman area. Many residents ABC Action News spoke with said they hope the improvements happen soon before more people are hit and injured or killed. To read the county’s full list of improvements in the Linking Lealman plan, click here.